Chilcot Report Postmortems: No Nuremberg-Style War Crimes Followup? 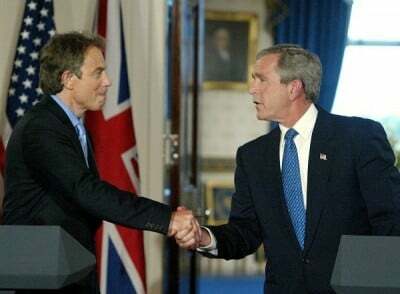 Complicit with George Bush, Blair decided on war, not his government, legal advisors or ministers – based solely on geopolitical considerations, flagrantly violating international law. He, Bush and their complicit officials waged naked aggression against a nonbelligerent country based on lies, damn lies and Big Lies – a media-supported drumbeat ahead of shock-and-awe devastation, followed by invasion, occupation, current violence and chaos at a cost of millions of civilian lives. Wage war based on lies and deception. Then apologize to grieving families, ignoring ones in countries attacked and horrors of current aggression elsewhere. On July 6, coincidentally with Chilcot’s publication, the White House was silent. State Department press releases covered a surprising 16 separate topics – nothing on Chilcot. He tried shifting focus to Syria and Washington claiming to help (sic) prime minister Abadi “do the things he needs to do in Iraq and to defeat (US-supported) Daesh. War on Iraq, of course, was planned and orchestrated long before Washington launched it in March 2003 along with Britain and other “coalition” partners. Blair signed on early. In a July 28, 2002 memo to Bush, he said “I will be with you, whatever.” Claiming removing Saddam from power was “the right thing to do” omitted explaining why war was waged in the first place. It’s part of Anglo-Zionist aims for regional dominance, eliminating independent governments, puppet regimes replacing them, and controlling the region’s immense hydrocarbon resources. What Chilcot didn’t explain matters more than what was covered in 12 volumes.